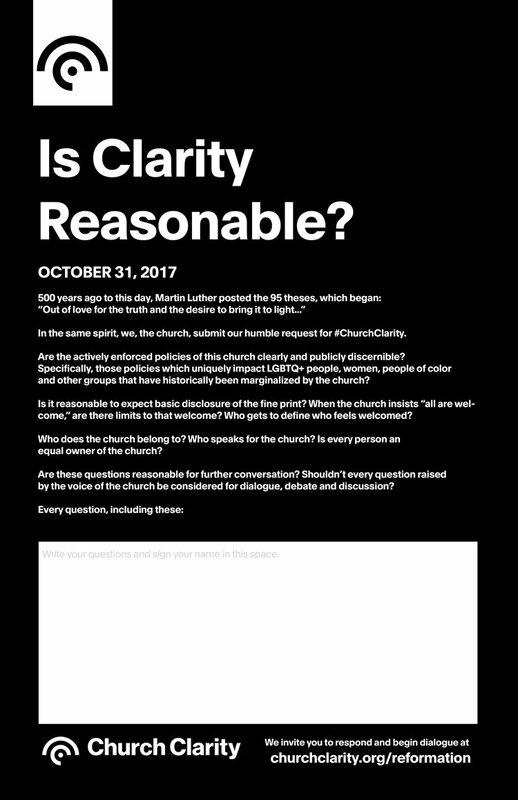 Church Clarity is looking for 500 people to help us mark the 500th anniversary of the Reformation (October 31) by posting signs on the doors of 500 churches around the world, snapping a photo and uploading it to the web. If Luther’s reformation was accelerated by the invention of the printing press, ours will be fueled by the power of the internet. Martin Luther's 95 Theses were made up of the most essential questions and talking points facing the church in 1517. 500 years later, our generation has some equally urgent questions for what has become the church, the power structures and the new “Popes “who create and communicate policies. At the very least, Clarity is reasonable for churches when it comes to policies that churches enforce, not only concerning the LGTBQ+ community, but other marginalized groups as well. Together, let’s continue the prophetic curiosity modeled by the church in previously critical moments of our history. Tape (painters tape, Scotch tape, or shipping tape only; DO NOT use duct tape or any other adhesives that could do damage or remove paint from wood or metal doors). A mobile phone with a camera. Once you have memorialized your Reformation moment by taping your personalized poster to the church door, snap a photo and either upload it to Twitter or Instagram noting the name of the church and the country, city, state/province hashtagged #ChurchClarity, or email to us at info@churchclarity.com and we’ll post to our account. Do not violate any trespassing laws to post these signs. Do not use any adhesives that could damage or remove paint from the doors. Do not, in any way, damage or vandalize church property. Do not be an idiot. Seriously, use good judgement. Consider the big picture. Consider the people who are desperate for change and how your actions have the potential be seen for positive change or in attempts to discredit a movement. Don’t participate for the sake of participation, but because you believe that it’s time for change. Our goal is to raise awareness of Church Clarity and to create a loud cry for clarity from the church on policies they actively enforce. Together, we can make a difference through this effort and shine a light on the need for clarity. On October 31, we will post and share all of the photos we receive from you and create a feed of content on ChurchClarity.com and through our social media channels. 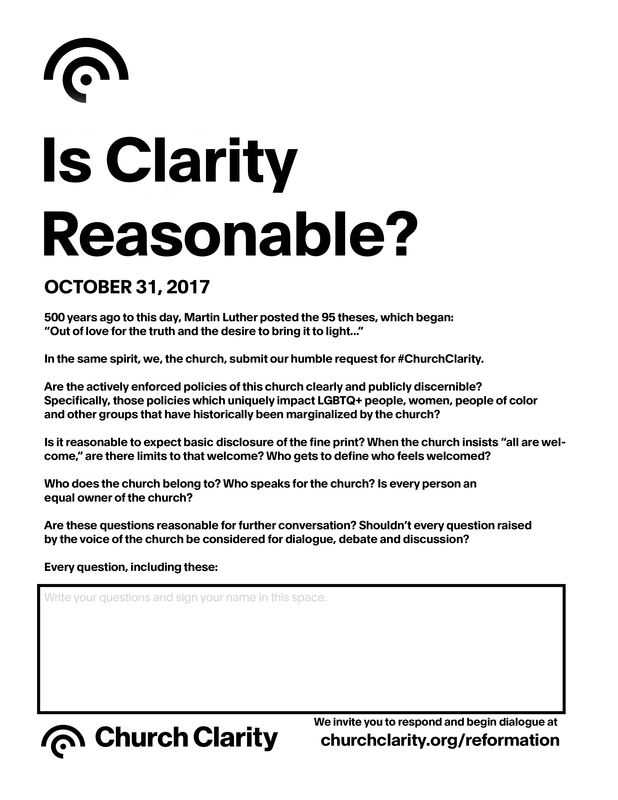 Additionally, we will launch a resource page for church leaders who received a poster on their doors to express our desire for clarity. This is not a flash in the pan moment. This the continuation of a reformation that has been fueled by many of you through movements, organizations, and initiatives for years and years and years.